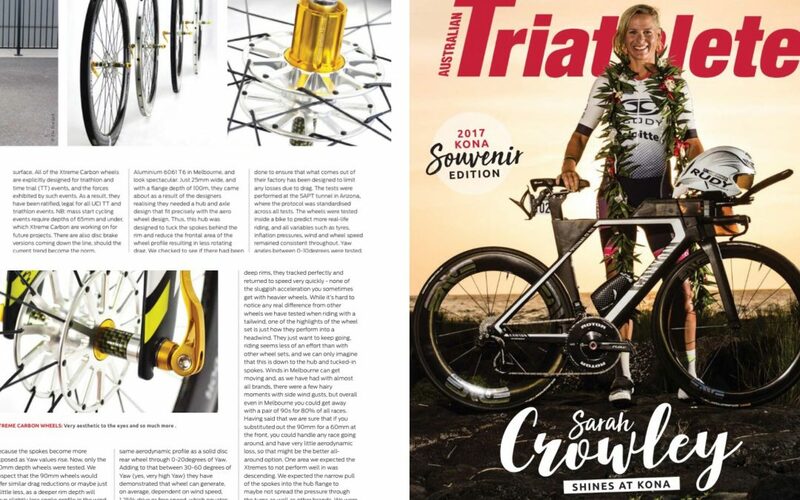 We’re so excited to feature in the Australian Triathlete magazine’s 2017 Kona Souvenir Edition. Get over to page 46 and read the full review on our 90mm front and rear Race Grade Wheels. The crew from The Test Lab put the wheels through their paces over the last few months and were impressed with how the wheels performed. Read full article here online here; magazine in store late November 2017. When we heard we were getting a pair of the Xtreme Carbon wheels to test, we expected to get a very cool looking and very unique wheel set. What we got ended up being so much more – an Australian brand, ready to go head-to-head with the industry leaders. Check out our full range of Triathlon Wheels here or get in touch with any questions. A brand for Carbon Fibre Cycling Components, all products are subject to (P) Patent Pending Internationally.